What Should You Know Before Moving to Edmonton? Edmonton, the “gateway to the North,” is located at the top of the Calgary-Edmonton Corridor and is a prime location for staging oil sands operations and diamond mining. It gets its other nickname, “the Festival City,” because it hosts many diverse festivals throughout the year. The West Edmonton Mall is perhaps the most noteworthy place in the city because it is the biggest mall in North America. 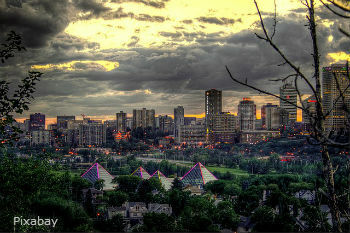 Edmonton also holds the distinction of being North America’s northernmost city with a metropolitan population over one million. Edmonton has a lot to offer, but if you plan on moving to the capital of Alberta, you should understand all aspects of the area. Edmonton has a humid continental climate according to the Köppen climate classification system. It is generally cool, but experiences all four seasons and drastic temperature fluctuations. The coldest average daily temperatures occur in January and are around -10 degrees Celsius. The hottest days are in July when the average daily temperature reaches 18 degrees. Heat waves and cold snaps can make the weather more extreme. There are stretches where the temperature routinely exceeds 30 degrees Celsius and there are periods where it falls below -20 for an extended period of time. Precipitation is relatively light in Edmonton. The summer months are rainier than the rest of the year, but Edmonton’s total yearly rain and snowfall is only about 477 mm. There is some extreme weather-- occasional droughts, thunderstorms, hail storms, and even tornadoes are possible. In a particularly bad case in 1987, an F4 Tornado killed 27 people in the city. Edmonton has 375 neighbourhoods which are divided into seven geographic sectors. Suburban sectors surround the “mature” sector in the inner city. Many of these sectors were previously independent municipalities, but were annexed in the 1980s. The mature sector contains five previously independent municipalities: Beverly, Jasper Place, North Edmonton, Strathcona, and West Edmonton. Edmonton annexed these areas in the early 1980s and they remain unique while being part of the city’s core. There are six sectors housing more residential neighbourhoods outside of the more urban mature sector. The majority of the metropolitan population resides here. The Oliver neighbourhood is the most populated, while Garneau has the highest concentration of residents. Edmonton is not the most diverse city in Canada. Nearly 72 percent of the population is white, with 23 percent visible minorities, and five percent aboriginal. There are still ethnic neighbourhoods, however--you can visit both Little Italy and Chinatown in Edmonton. The crime rate in Edmonton is high compared to other cities in Canada. Canadian news magazine Maclean's ranked Edmonton as Canada's 19th most dangerous city in 2012 and reported that it had 29 homicides that year. Residents consider the northern part of the city home to the most dangerous neighbourhoods. Edmonton has three public school districts for elementary and secondary schooling--Edmonton Public Schools and Edmonton Catholic School District are the two main English-speaking school boards. Greater North Central Francophone Education Region No. 2 represents the Francophone minority. This school board extends beyond just Edmonton to cover many francophone schools in the larger region since they are uncommon in the area. Private elementary and secondary schools include the Edmonton Academy, Progressive Academy and Tempo School. Edmonton is also home to several post-secondary institutions. The University of Alberta, North Alberta Institute of Technology, and MacEwan University are some of the most notable schools in Edmonton. The U of A has an annual revenue of over one billion dollars and houses the second largest research library in Canada. MacEwan University regularly has a student population of over 43,000 students. NAIT enrolls 61,200 students in over 200 different programs. When you think of industry in Edmonton, you think of gas and oil. There's $57.8 billion in products in the region, and $34.4 billion are from the gas and oil industries. 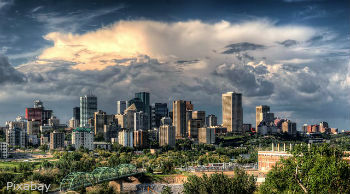 Edmonton earned the nickname “the Oil Capital of Canada” by being second to only Saudi Arabia in worldwide oil reserves. The recent downturn in gas prices may hurt Edmonton’s economy, however. Edmonton has additional employment opportunities in other industries. Edmonton hosts many successful IT, banking, software development, biotechnology, and retail business. The West Edmonton Mall is the biggest mall in the continent and the flagship of Edmonton’s retail industry. Edmonton has an unemployment rate of just five percent as of December 2014, which is lower than most Canadian cities. Edmonton’s income is 26 percent higher than the national average. 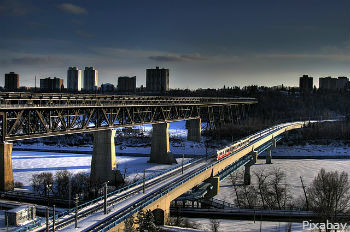 Edmonton’s cost of living is usually considered one of its advantages. Its proximity to abundant oil resources allow the city to have some of the lowest gas prices in Canada. Housing is also relatively inexpensive--the average monthly rent for a furnished 85 square meter apartment in an expensive area (Downtown) is only $1,600. Utilities for the same type of apartment come to about $239 a month. Edmonton does have high prices for food--both grocery stores and restaurants are rather expensive. Meanwhile, taxes are average for a Canadian city. Some Edmontonians have expressed concern about the prevalence of the oil industry. As more immigrants come into the city to work in the industry, housing prices will rise. A common opinion is that workers do not get paid well unless they work in the oil industry. Edmonton is a working city that is affordable for most of its workers. The average per capita income is about $43,000 before taxes. Unlike more congested Canadian cities, Edmonton residents prefer to use cars. The Edmonton Transit System has a light rail and busing network, but the delays and prices discourage commuters who usually don’t deal with extensive traffic. Only about one third of Edmonton’s commuting workforce uses public transportation. Roads in Edmonton are unique because they are numbered rather than named to make them easier to find. It is not all good on the roads, however. Some Edmonton residents have complained that snow is not cleared in a timely manner. Edmonton does have an extensive network of bike paths, but they are primarily used for recreation rather than commuting. In terms of broader transportation, Edmonton is an important hub for the Canadian National railway and the Canadian Pacific Railway. The downtown area hosts many festivals during the summer months. The Edmonton International Street Performers Festival is one of the most well-known. This festival draws street performers from around the world in a unique display of entertainment. You can expect to see many quirky and artistic festivals like this in Edmonton, especially during the warm months. K-Days, short for Klondike Days, is the most popular seasonal festival in Edmonton. This festival has existed since the late 19th century! K-Days essentially turns the city into an amusement park for 10 days in the summer. It includes games, rides, performances, parades, competitions, and shops. It is a family friendly tradition that can’t be missed. Despite the focus on festivals, there are some interesting locations in Edmonton year round. The Royal Alberta Museum (RAM) is the biggest of the city's many museums. It houses over 10 million objects in its exhibits and focuses on the diverse aboriginal tribes that historically lived in Alberta. For a more hands on experience, visit the Telus World of Science in Woodcroft. This science center has many temporary exhibits for curious children and science-loving adults alike. It also houses a planetarium, IMAX Theater, observatory, and an amateur radio station. Edmonton earns its derisive “Deadmonton” nickname due to a perceived lack of nightlife. However, there are some bars and nightclubs in the city. Whyte Avenue (82 Avenue) has a strip of bars and clubs to explore. The bars and restaurants in the area are also close to the University of Alberta, so expect to see university students in the area. If you aren’t satisfied with everything else in Edmonton, certainly the massive West Edmonton Mall has something for you. North America’s biggest mall has a variety of luxury and bargain stores in addition to an indoor amusement park, theaters, and a myriad of restaurants. Have you decided that Edmonton is the right place for you to move? Start comparing companies and getting free quotes today! Just remember to get at least three different quotes from three different companies to get a fair price for your move. Prepare for harsh weather. There are harsh winters, frequent thunderstorms, hail, and the occasional tornado. If you use public transportation, give yourself extra time. It takes 90 minutes to head downtown from some residential areas. Give yourself extra time when you arrive. Edmonton International Airport is 26 kilometers away from the city. You can’t do everything there is to do at the West Edmonton Mall in one day. Watch the Edmonton Oilers at Rexall Place if you want some hockey action.